The news comes via a spokesperson from the Clark County Coroner’s office, who revealed the information to MMA Fighting on Monday. Follis was a former coach at Xtreme Couture and also a founding member of Team Quest, who was well respected in the sport. He died on Friday of a gunshot wound to the head, the spokesperson confirmed, at Nevada State Route 160. Follis was 48 years old. The MMA community reacted to the news on Sunday of Follis’ death, with fighters, fellow coaches, friends, and associates taking to social media to celebrate his life. UFC President Dana White, referee “Big” John McCarthy were among those leading tributes to the coach. “As one of the founding members of Team Quest and Xtreme Couture MMA it is with great sorrow that we say good bye to Robert Follis. Robert was a friend, coach, mentor, and philosopher of martial arts to many of us. It is with a very heavy heart that I write this tribute to a man that touched so many. Death is like the sun. There is no escaping it. It infuses every part of our lives, but it doesn’t make sense to stare at it too long. That becomes a real challenge when someone you know, love, and respect ends their life. This is where Robert has been since his brothers passing a couple years ago and where we are left now. It is very easy to get caught up in the urgency that comes from the limited span of our lives. It can push us to obsess over life’s meaning in the time we have. But obsessing over it, and staring directly at it too long can blind us to the possibilities of living. “Robert was a Hero to many. Heroes have the whole earth as their tomb . . . There is, enshrined in the chest of every person he touched, a record unwritten with no tablet to preserve it. It’s that which he imprinted on our hearts. What lives on is not what is engraved in stone monuments, but what he has woven into the lives of others. Those who have lived with us become a part of us. We honor the dead by living their values. Through our efforts, we ensure that the good things they stood for continue to stand even when they are gone. Robert stood for many good things. Let’s let Our actions become a living memorial to Robert Follis.,” Former UFC two-weight champion Randy Couture wrote. “You don’t realize how much of an impact you had on my life. A good coach is so much more than someone to teach techniques. Through the darkest moments in my career and life you’ve helped me see the light and keep pushing. I thank you for everything and apologize for everything more. The next gold belt is for you,” UFC lightweight contender Kevin Lee posted to Instagram. 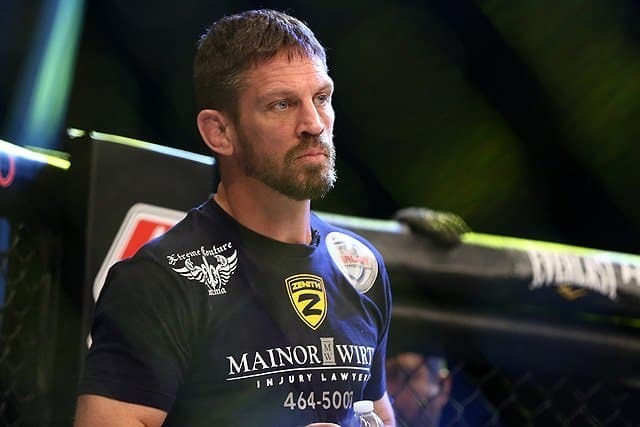 Follis was, for the last four years, head coach at Xtreme Couture and oversaw the training and development of fighters such as former UFC women’s bantamweight champion Miesha Tate and Kevin Lee, to name but two. Follis left the gym in early December and had planned to open a new gym. Follis was also a co-owner of the legendary Team Quest, along with Randy Couture and Matt Lindland.